The Bubble Nebula, NGC 7635. Original image credit: Eric Mouquet. The Bubble Nebula illustrates how revolutionary progress in theoretical understanding changes our perceptions of the universe. Before space telescopes and modern telescope technology, astronomers photographed rings of dim light. They called them planetary nebulae. Under the accepted presumptions about exploding stars, they concluded that the rings were spherical bubbles of hot gas. The appearance of the ring was due to edge-brightening, the increase of luminance from viewing a greater depth of gas at the edge of a sphere. Then new telescopes and technology enabled astronomers to get a more detailed look. The details contradicted the spherical model. Astronomers found filaments, bright spots, braided threads, overlapping rings, rings stacked along an axis common with the star, hourglass shapes, coaxially aligned tubes of evenly spaced filaments. It became apparent that the structures were cylindrical and that they pinched down to slender necks in the vicinities of the central stars. Often, a small disk or ring could be detected around the star (which was usually a binary) in its equatorial plane, like a donut on the stick of the cylinder. Standard gas dynamics and gravity theories were hard-pressed to account for these observations. Even magnetohydrodynamics, which incorporated some aspects of magnetic theory, was “surprised”—an attributive that became commonplace as the observations flooded over the traditional presumptions of astronomy. Ad hoc patches and casuistic exceptions have torn the once-beautiful coherent fabric of astronomy and astrophysics into an ugly ragbag of clashing and frayed excuses. The promise of a new coherent theory has risen from the accumulating findings of the handful of electrical discharge investigators over the past century. Electrical discharges in both laboratories and nature display just this kind of cylindrical filamentary structures, which are called Birkeland currents. The hourglass shape, with all the accompanying aspects of planetary nebulae, has been well-studied and is called the Bennett Pinch or the z-pinch. The field has come to be known as plasma physics, and its application to phenomena in space is called plasma cosmology, which is an accepted discipline among the many recognized by the Institute of Electric and Electronics Engineers (IEEE). 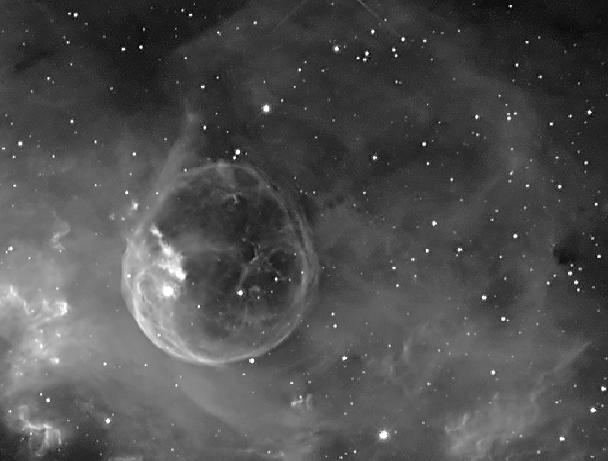 A close examination of the image of the Bubble Nebula (above) reveals many of these characteristics. (Color image here.) One needs to keep in mind that the image is looking almost exactly down the axis into the funnel of the hourglass, and therefore the cylinder of current (or cylinders: these are often double, as in the aurora) will appear as a circle. At the upper right, the ring is doubled or even tripled. That may indicate two or three regions of increased density that the current passes through on its way toward the central star, or it could reveal a double coaxial tube structure typical of Earth’s aurora. (Planetary nebulae may be thought of as stellar aurorae.) In either case, each ring segment is composed of evenly spaced bright spots connected by dim radial filaments. These mark the individual Birkeland currents that compose the sheet current of the tube. They can be traced both inside the ring, as they run down to the center of the hourglass, and outside it, running as straight as the ideal geometrical line. The bright patch and curlicue on the left side of the ring may be a diocotron instability in the current sheet. These instabilities are commonly seen as the swirls that develop in the aurora. If the nebula is a large (on a stellar scale) pinched current, it carries more than enough power to supply the radiation “load” of the central star. Hence, the star is likely powered by electricity through coupling with the nebular discharge current, rather than by internal nuclear fusion. At the other end of the argument, the nebular current can’t cease to exist beyond the limits of its optical glow. It must be part of a circuit that winds through the galaxy. Electrical couplings between circuits at different scales, from superclusters of galaxies to planets and even to their weather, tie the universe into a unitary organic electrical structure and provide the coherent theory of cosmology that modern astronomy has lost. Traditional astronomy is likely to go the way of the old astrology, and the future study of the stars will be done in the Plasma Cosmology division of IEEE.